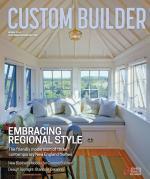 Custom Builder magazine is a supplement to Professional Builder magazine, and serves as an industry news source for builders and designers of one-of-a-kind custom homes. Each issue delivers content about business management solutions, design ideas, and product news to inform and inspire your next project. Since 1936, Professional Builder has been a leading business-to-business media source for the U.S. housing industry, delivering award-winning content in print, digital, video, email, social, and in-person channels.